New VoIP (Voice over Internet Protocol) features for our business customers. Metro FastNet is Now Offering VoIP to our Residential Customers too! VoIP uses your high speed Internet connection to replace your phone lines. Voice Streams let you use your normal phone or PBX just like you've always done. The only change you will notice is a lower phone bill. Call us today and see how we can save your business money and streamline productivity. The Hosted PBX: Do you have external personnel? Are you working from multiple locations? Metro FastNet's VoIP will provide your company with a communications solution that delivers high quality digital voice services with powerful features for small to large businesses. Your business benefits from minimal start-up costs, reduced total cost of ownership, flexible service features and complete scalability. Our Hosted PBX has many great features. We can even simultaneously ring your extension at multiple locations or have your calls forwarded to your cell or home phone. Allow your customers to directly dial your employees or departments. VoIP can be controlled from your handset and/or online. Call us now to put these VoIP features to work for you. Telephone Service Assurance: VoIP from Metro Fastnet offers you a new way to never be without telephone service. 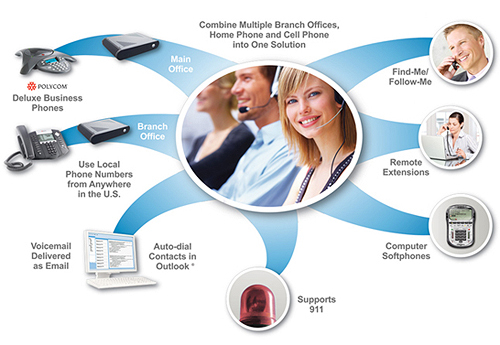 VoIP trunks can be brought into your current PBX, providing your telephone service through two diverse access points. Call us now for details on how to keep your people talking. Contact Us with Information about Your Voice Needs!